The NVIDIA CUDA Sparse Matrix library (cuSPARSE) provides GPU-accelerated basic linear algebra subroutines for sparse matrices that perform up to 5x faster than CPU-only alternatives. You can use the flexible C and C++ interface to sparse routines, pre-conditioners, optimized precision computation (double, single, half) and data storage formats to develop applications that deliver the highest performance with least effort. cuSPARSE is widely used by engineers and scientists working on applications such as machine learning and natural language processing, computational fluid dynamics, seismic exploration and computational sciences. 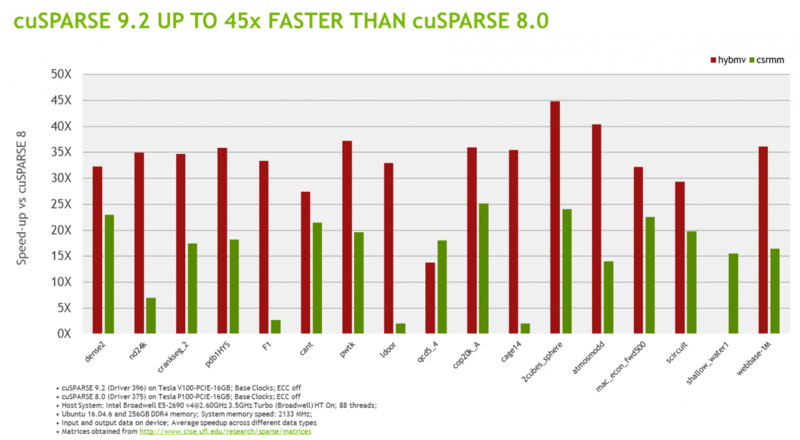 The CUDA software platform is highly optimized for execution on NVIDIA GPUs and performs 2X-5X faster than CPU-only alternatives. The cuSPARSE library is freely available as part of the CUDA Toolkit.